Seeking inspiration in nature and using 3D printing, one automation company has created ants, flying butterflies and a lizard-inspired gripper arm that may be the future of robotics. Festo, a private company specializing in industrial control and automation based in Esslingen am Neckar in southern Germany, has a history of making robots inspired by nature. 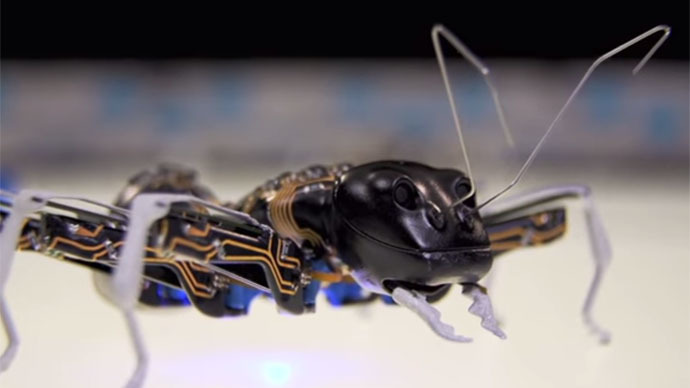 Earlier robot models have been shaped like fish, birds and even a kangaroo. The company’s latest creations, however, drew inspiration from the world of insects, and used 3D printing to push the envelope. Festo’s BionicANTs are built using a form of 3D printing called Selective Laser Sintering (SLS). The molded circuitry is mounted on the outside of their bodies, and they move using piezo-bending transducers rather than traditional servos. In addition to autonomously moving their six legs, the ants have a pair of working pincers. The antennae are actually charging points for a battery that provides about 40 minutes of activity per charge. According to the company, the “eMotion Butterflies” are an experiment in making small robots able to fly in tight spaces. Two miniature servo motors power the wings, made of carbon fiber rods mounted on laser-sintered bodies. The tiny robotic butterflies, weighing only 32 grams (1.12 ounces), can fly around for three to four minutes, coordinated by GPS and infrared cameras so they never collide. Chameleon tongue served as the inspiration for the FlexShapeGripper, a robotic arm with amazingly precise gripping ability. Featuring a silicone cap that adapts to the target shape, the gripper can pick up, hold and release multiple objects with precision and ease.